The point is the new series is a lie. It’s important to understand that NIWA have a Bible and they know how to thump it. Rhoades and Salinger 1993, Adjustment of temperature and rainfall records for site changes (R&S), is the NIWA Bible for estimating the effect of known site changes on temperature and rainfall measurements. That wearisome statement appears in the Overview portion of the 7SS Review, in the discussion on each and every one of the seven stations, and R&S is mentioned as an authority many times in its 169 pages — nowhere does it mention any deviation from the well-established scientific methodology in R&S. Before the 7SS Review began, NIWA and its minister, Wayne Mapp, made it crystal clear in media releases and in answer to questions in the Parliament that they’d be using R&S to make the adjustments. But NIWA didn’t follow Rhoades & Salinger. They did whatever they liked so they could show warming. NZ Climate Science Coalition scientists published their devastating independent Statistical Audit of the NIWA 7-Station Review (pdf, 2.8 MB) on August 6. Why is it devastating? Because it proves that NIWA’s 7SS Review finds warming only by disregarding the statistical techniques it said it would use – Rhoades & Salinger. The reality is that New Zealand has had no strong warming for a hundred years, and NIWA lied to us. NIWA has done the unthinkable and ditched the R&S methodology. From beginning to end, their statistical calculations largely ignore the scientifically validated procedures that are carefully set out in R&S and instead use unheard-of methods containing obvious flaws. They use remote stations (up to 1100 km!) instead of neighbouring ones, unsymmetrical periods instead of symmetrical ones, annual data, when R&S is specific about requiring monthly data, ignore the R&S requirement to weight the averages according to the correlation with neighbouring stations and they use many years of comparison (up to 11!) instead of strictly one or two years. The 7SS Review was the subject of a specific $70,000 item in the Vote: Science estimates for the 2010-11 fiscal year. It was obviously the Parliament’s intention that these funds would be used in applying the best available science to the historical data. That was not done and the money was apparently spent instead on some “made-up” junk science with the object of deriving a warming trend which was the same as that shown in the old 7SS. This diversion of taxpayers’ funds will surely be of interest to the Auditor-General. To verify the 7SS, NIWA wheeled in the 11SS, which they themselves invented with Jim Salinger, has data missing everywhere and is laughably unscientific. Far from substantiating the 7SS, the 11SS merely ruins NIWA’s integrity. When we asked what they’d done, they cynically cited the scientific literature that they did not follow. First they mentioned Salinger’s thesis (but it wasn’t there – think what that means!) and then R&S (which contained a good methodology, but Salinger hadn’t used it). Now we find that NIWA hasn’t used it, either. When NIWA announced the 7SS Review, they said they would use R&S for the adjustments. Fair enough. We waited for the report. Now we have examined the report. They didn’t use R&S. NIWA lied to everyone. It seems incredible that this agency has a monopoly on advice to the government on global warming when they’ve blatantly cooked the books to inflate the New Zealand temperature record. Who’s going to call them to account? Is their Minister paying attention? The R&S paper dealt with two aspects of non-meteorological site changes: sudden change (e.g. relocation), for which it gave statistical techniques for offsetting adjustments; and gradual change (e.g. shelter, UHI), for which it advised firmly and unequivocally to omit the station. They failed to do either. Can we ever trust them again? OMG…. Publicise this, PLEASE! – donation on it’s way. C’Mon guys ‘n gals!!!! 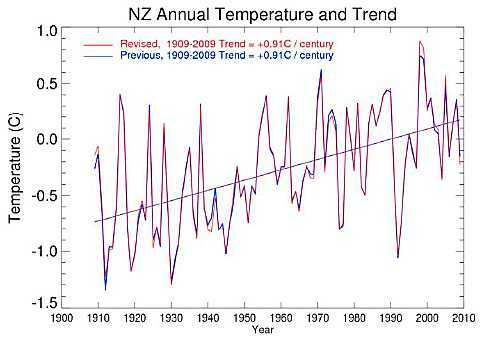 The reality is that New Zealand has had no strong warming for a hundred years, and NIWA lied to us. NIWA’s lengthy report on its Review of the 7SS certainly makes a meal of its reliance on Rhoades & Salinger (1993), but it also mentions a host of other authorities in the various bibliographies shown at the end of each chapter. Glancing through the titles, most don’t seem to deal with statistical techniques for homogenising temperature data – at least, not in a New Zealand context. But there might be something buried in there somewhere. I’ve tried to Google the paper “Salinger et al (1992)” which they mention. Couldn’t find anything so I raised it with an academic climate scientist. She thought she knew all of Salinger’s publications, but doesn’t have any record of this one. Surely NIWA must have been relying on something that’s been published since 1993! It’s hard to credit that a government agency would just make it up as they went along. And they knew they were going to be challenged, because Court proceedings are already issued against the original 7SS. In the land of the free-to-sue, it would strike me that saying that NIWA “lied” as repeatedly as you do here should lead to a lawsuit for defamation of character or something. Tim Ball of Canada is in a lawsuit because he suggested, sarcastically, that Michael Mann should be IN the State Pen instead of AT Penn State. You have put out in the public eye evidence to back up your unequivocal statement that NIWA lied. You also state unequivocally that funds specifically directed to use the R&S methodology were not so used. That should be good for a claim that fraud is involved. Will anything happen? At some point one would think so. But if you are a warmist who claims that deniers are, well, in denial, heretics or other marginal, mentally unstable individuals whose ego-self-identity is threatened, perhaps you don’t have to. When the new NIWA came out with an almost identical temperature chart, I wondered if I were as foolish as the warmists claim me to be. I mean, I looked at the original 7 stations and could not see how they came up with the rise in temperature in the first place. But after an “exhaustive” relook after slinging Salinger, they came up with the same result. So what was I missing? Braincells, apparently, I thought. Now it looks like you have found the reason intuition didn’t match results. The results were matched to policy. All very, very, strange. I keep avoiding conspiracy thinking, but each day it gets harder to do so. What is the status of the legal challenge? Good comments, thanks. On the libel point: in New Zealand, you can libel an individual, but not an organisation. So far, I have been careful to avoid naming the officeholders in NIWA who must have either made these decisions or known of them yet said nothing. So far. Their responses to this might determine whether I continue not to name them. The next step is a hearing, which has been scheduled for next year. I don’t know why it was delayed, but it’s entirely up to the judge. Yes, I thought, because they were scientists with PhDs, they were clever people. But they’re not, they’re just as venal, self-interested and short-sighted as the rest of us. Pity. Perhaps this type of carry-on isn’t confined to little old New Zealand? “The latest Rasmussen Reports national telephone survey of American Adults shows that 69% say it’s at least somewhat likely that some scientists have falsified research data in order to support their own theories and beliefs, including 40% who say this is Very Likely. You’ve accused a national institution of lying to the public. If what you say is true, this ‘investigative reporting’ is a major service to the New Zealand government and to the taxpaying public. Questions of libel can arise only if your facts are wrong or your opinions are not genuinely held. Given that you have been blogging for about 2 years that the NZ temperature record is flat wrong, I’d be surprised if your stated belief in deception by NIWA is not only authentic, but strongly held. It’s hard to see where your facts can be wrong, as NIWA clearly didn’t apply the techniques set down in R&S93. But perhaps it was just incompetence rather than deception. If there are any mistakes, NIWA now has the opportunity to set the record straight. The ball is clearly in their Court. I was unaware that a strongly-held belief might be a defence against libel. But perhaps it was just incompetence rather than deception. This concerned me for a while, but someone pointed out that NIWA had shouted from the rooftops that they used R&S. They knew they shouted. They knew what method they used. To assert that they were merely incompetent in not using the method they rudely shouted at us is unbelievable. They knew. Richard, this clearly deserves a wider audience. Do you have any objections to posting this link on other blogs? None at all. Just so you know, I’ve sent a brief announcement, with the link, to WUWT, Steve McIntyre, Jo Nova, Ian Wishart, Leighton Smith, Marc Morano, NZ Herald, Dom Post (and I’ve spoken with a reporter there), Christopher Monckton, TV1 and Scoop. But the more, the merrier, boys, go to it! It’s an important message and it’s nothing to do with me — it’s for everyone. Advise these same people again or advise others or do both. Egg on face plus a possible loss of a strong source of ‘feel-good’ revenue will preclude a rapid response. Delay is the only recourse on the part of Government agencies. Don’t hold your breath. I agree, Ross. We must put pressure on them like we never have before. We must not let up. Please spread this around. Richard – can you provide a copy or link to the Rhoades & Salinger (1993) paper that NIWA said they were using? Thanks for the question, Borealis. My apologies, this ought to have been provided already (it’s in my downloads!). Here is Rhoades & Salinger 1993. I put a note on Bishop Hill’s unthreaded topic. I wouldn’t expect our “liberal” media to pay much attention to this, so I’m not holding my breath. I hope you guys have read this! http://www.australianclimatemadness.com/2011/08/csiro-mustnt-criticise-government-policy/ Gov corruption of the CSIRO I would think NIWA is the same species of animal. Therefore everything CSIRO has put out is Gov lies and propaganda. Put out the Gov policy or get sacked! Richard, I am absolutely unsurprised about this latest piece of dishonesty from NIWA that you have revealed. If anyone doubts the dodgy ‘science’ and the even-worse bludgeoning of statistical procedures that underpins the entire CAGW nonsense worldwide, I suggest reading AW Montford’s (Bishop Hill of the blog of the same name) excellent book, ‘The Hockey Stick Illusion’. This book has been on sale for a good while now and has prompted not a even a hint of legal action from any of the ‘Hockey Team’ or even from Dr Mann, who seems to scream for the lawyers at the drop of an assertion. As an ‘arts’ person rather than a ‘science’ person, I have always been sceptical of the notion that scientists equipped with Phuds must all be morally and ethically innocent and shining; working with a bunch of them back in the days when the doom-mongering idiot Erlich was the darling of the Liberal Left intelligentsia sharpened my scepticism more than a little. Could I respectfully suggest you add ‘No Frakking Concensus’ to your list of blogs that you have sent this information to. Has anything been sent to NIWA asking for an explanation for your “apparent” discovery that they didn’t use R&S(’93)? About two weeks ago, the NZ Climate Science Coalition wrote to the chairman of NIWA (Mr Chris Mace) requesting the Board to undertake an internal enquiry. The letter included a copy of the NZCSC’s critique of the NIWA Review of its 7SS, along with the statistical audit. There has been no response as yet. You have to wonder, what would happen if NIWA were given a double blind trial. i.e One group gets shown the original 7SS results, and the other were told to recreate the series without any knowledge of the original series. I suspect the results would look quite different. It doesn’t have to be fraud, but there has to be some element of bias in knowing the desired outcome. Of course! Will do. Thanks, Alexander. it has been remarkably quiet on all fronts with respect to this issue. Such a set of question should be accompanied by a very unemotive press release or two and you may find you get national press coverage. Richard, its not at all surprising of course. However, our governance in parliament will bury this from the public just like they bury everything else. Global warming is fact, dont you remember the PM’s own chief science advisor telling us all? Do they have to reply? 1. The silence, begging a reminder. 2. The reminder, receives a “We’re reviewing the issue.” Second silence. 3. A second reminder receives a “We’re replied to your question as of …..”. Third silence. 4. A third reminder receives a “As stated earlier, we have replied to your question previously. Due to other more pressing matters, we shall not be responding to further queries or variations thereof, on this subject.” Fourth and terminal silence. So, do they actually have to respond to your position, or is this a matter for your MP (after the fourth, terminal silence). I want it to work the other way — expose it to the public, who raise such a clamour the goverment must act to fix it. That’s how the global warming nonsense reached this stage, with a misinformed, well-intentioned public clamouring for action. Governments follow the public will, they never lead it. We are the political system. We don’t need a “party” until the end. Anyway, National might yet govern alone. All the blatent deceits will go on (there’s too much money involved) until the honest skeptics like me rise up and take action. This is an Election year and a mass protest to M.P.s (and Ministers) is what is needed. How can we get all the people who are concerned at these deceits to act together? We need some national database to coordinate action. The Climate Realist and NZ Climate Science (and any other skeptic organisation) need to cooperate to get action NOW. Come on guys. Write and e-mail the Prime Minister, all Ministers (especially Nick Smith) and the Speaker of the House as well as all media outlets. (TVNZ were disgraceful in their behaviour re Lord Monckton!). There is strength in numbers. The Rugby World Cup may have centre stage (funny that, just before an election) but it will be an opportunity that we should grab. Dont let people like Neil and Ester Henderson etc. etc. take all the load. Get up and gert on the phone / computer or write to EVERYONE you can think of!! Make it an election issue and we will get noticed!! We need to create more grassroots interest. I get the feeling that a lot of NZers are asleep at the wheel on this issue. It’s a different story in Aussie, where the “carbon tax” might yet bring the government down. A good start would be to ask the govt how much the ETS has affected the average family’s budget. These questions were asked a year ago when the ETS was introduced, but all we have heard is how “successful” the ETS has been. Couple increased bills with dodgy science and you have got an interesting little angle. Well said Simon, I am with you, I have been e-mailing my local MP, Nick the Climate Clown Smith and John the Don Key re the ETS Scam for some time now and continue to do so. We need many many more to do the same. Yes, you well describe how leaders can avoid being brought to account. You’re correct in implying that in public they need not answer if they don’t want to. But that doesn’t apply when they go to court. And this revelation will go to court, and they will be required to answer if they have not already done so. When the campaign against the ETS was in full swing last year, I wrote to both Nick Smith and John Key. JK’s email was forwarded to Smith, as this is his portfolio. Nick Smith, to give him credit, did actually write a response to me that addressed the points I made. I don’t think Smith is stupid. He understands the climate issue – I have heard him talk about the issues around feedbacks and the uncertainties therein. Of course, he is playing realpolitik too. In that respect, an accusation of fraud might actually get some traction with him. He was one of the architects of the ETS. In addition, he quoted Gareth Morgan’s book Poles Apart as his reference for climate. I think that was as far as his reading went, but I could be wrong. I am mentioning this because list MPs often seem keen to engage with the electorate. Nikki Kaye in Ponsonby also springs to mind as she seems quite keen on the ETS. I found that a mass-mailout didn’t really work and most MPs saw this as a spam campaign organised by ACT. Could be a Job for Hone Harawira. A) He thinks Global Warming / ETS is B.S. B) The ETS affects his supporters and makes them even poorer. If he needs an example of how this country is mismanaged by not so bright people, who run an unethical government department with MPs from all sides playing see no evil hear no evil, this could be good fuel to put heat on a few MPs in the house. 4. Observations show that the earth’s radiation budget is out of balance. If these 4 arguments were updated to reflect new knowledge gained over the past 3 years, they would point in the opposite direction. I believe this condition is referred to as “projection”. Please cite a specific example to support your “projection” hypothesis. It appears to me that Richard C’s opinion was self-effacing when he added “the rest of us”. It was a humble addition. It was a moderating addition. It was the opposite of “venal, self-interested and short-sighted”, which I think underscored his point rather elegantly. So, to underscore my challenge to your rather arrogant (imho) assertion of projection: Please quote Richard C being, in your humble opinion, “venal, self-interested and short-sighted”. Richard T, that would be (my bad). NIWA said they would use the careful procedures specified in R&S. But they did not. The defects we found and documented in our paper include comparing sites up to 1100 km apart, instead of only neighbouring ones; using asymmetric periods instead of symmetrical ones; annual data, when R&S is specific about requiring monthly data, and other flaws of a serious enough nature as to demolish any confidence in the new New Zealand temperature record. They overstated the NZ warming by 168%! 1. Could the demonstrated failure to follow so many (nine or more) of the R&S methods arise in professional scientists from accident or incompetence or only by deliberate decision? 2. Could the purpose of the failures, if deliberate, be to serve scientific truth or only to further the scientists’ organisation’s (or their) own ends? 3. Do you agree that my description of those scientists as “venal, self-interested and short-sighted” is justified by the demonstrated defects alone, regardless of whether I’ve engaged in “projection”? When I compared them with “the rest of us”, I was, as Mike Jowsey correctly infers, expressing humility and also, it must be said, a sense of disappointment that at least this group of modern scientists has publicly departed from erstwhile dependable standards of integrity. I’m wondering how you justify their behaviour to yourself, in your own heart. That you do justify it is clear from your only question, which criticises me and which analyses neither our report nor NIWA’s actions. Get serious. We are eagerly waiting for your earnest and honest response, but not holding our CO2-laden breath….. The forthcoming election campaign could be an opportunity to extract facts and highlight the issue. National presumably just want to remove it from the agenda, hoping that people don’t notice and the MSM won’t push them on it! As Pielke Jr said, the NZ ETS is a folly and debacle. NIWA has had ample opportunity to respond to this blog’s allegations of lies and deception in an area of key importance. They have preferred to go to ground, which is close to being an admission of guilt. So, if the Board now knows that their staff lied, don’t they have a responsibility to take action? Yes, they do — well, nobody else does, unless it’s the Auditor-General. The longer they delay, the worse their tattered reputation becomes in the eyes of the public. I’m gobsmacked. Are you all paid by the oil industry? What possible advantage can there be in making up climate change or global warming? Who stands to gain and who stands to lose? The losers are obviously the fossil fuel industry, or so it would seem. I’m gobsmacked by the accusations re NIWA and will endeavor to follow up, I’m stunned that they would deliberately falsify information and await the outcome of the cost case, but I’m equally stunned by the suggestion that the entire global warming issue is a hoax, help me here, who stands to gain from this? So it would perhaps seem until one does a bit of research. No, we’re not paid by anyone, least of all industry of any kind. Economic gains: Insurance, double glazing, wind turbines, solar heating, air conditioning, refrigeration, solar power, electric cars, many others—oh, and the oil industry won’t lose from global warming, oil is already indispensable. Scientists look for research funds where their work intersects with climate, so they make strenuous efforts to make sure they find a climatic connection. For example, they might love studying dolphin social interactions, but they stress global warming ‘threats’ when applying for grants. Environmentalists push the global warming wagon for political gain and for the growth of their organisation. More than that, who’s to say what someone else’s motivation is? I just look at the scientific evidence, which says CO2 cannot cause enough warming to be alarming, nor can the atmosphere warm the ocean (the ocean has been warming the air for 4 billion years). If you look carefully, you’ll notice that we say NIWA made mistakes in constructing the NZ temperature record, except when they won’t explain things. They have been very unhelpful for many years. So we say NIWA said they used the RS93 method, but our calculations show they didn’t, so are they lying? And other things to ginger them up so they do something. Have a poke around here, and go to other sources; it’s a very interesting topic.